Universal all-terrain robot Mirage with wireless audio and video communication system, radio-operated. It has two engines and one night vision camera. Light and mobile. It can overcome various obstacles using special mechanism of power transfer on each wheel. 2.4 GHz video signal. Working time 5 hours (depends on operation mode). 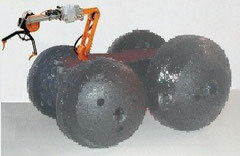 Robot reaches – 300 m on open surface, 100-150 m indoors. Robot Mirage 2 is an advanced model of the robot Mirage. It has more powerful backlight night vision and an additional folding electro-mechanic arm with a clamp. It can transport small loads and drop them in a specified location. There is possibility to adjust shooting angle and to zoom. Using its electro-mechanic arm Mirage 2 can switch on the transported load or work with help of the clamp with 180 degrees rotational moment. Powerful lighting allows working in the distant dark rooms. Working time a robot to 2-3 hours (depending on the mode). When working with electro-mechanic arm, working time the robot is significantly reduced. Robot reach of 500 meters on open surface, up to 100-150 meters indoors (depends on type premises). The aerials visual is hidden. While transporting metal loads additional aerials are used. 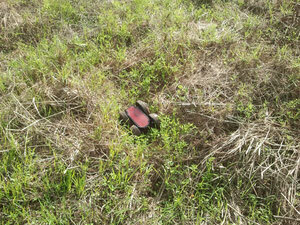 Controlled Mine Detection Robot Mirage 2. Our aim in building this project is to create a wireless controlled robotic vehicle which can be operated through a range using RF transmitter and receiver. This can also sense the obstacles on its way to maneuvering its path by using Infrared sensors. This vehicle is equipped with a metal detector can detect any land mine on its way, and wireless camera which will transmit the live pictures and videos remotely. This unit is helpful and useful for surveillance of an area in defence grounds for enemy, spying purpose where the human reach is not recommended or avoided. The unit is small handy portable and can reach places easily.